Probably, you didn’t know that there is a secret night mode feature on YouTube. So, in this tutorial, I’m going to show you how to enable YouTube dark mode in Chrome, Firefox, and Edge browser. The bright interface looks good at daytime, but at night it can be blinding. 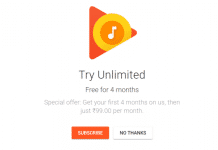 YouTube is the largest video streaming giant of the world. If you watch a ton of videos in the night time and don’t like the white-red interface, then this feature could save your eyes. Most of the electronic screens emit blue light, which is very dangerous for your eyes. The harmful blue light causes headache, eye strain, etc. So, major sites have gradually begun launching their own versions of a ‘Dark’ or ‘Night’ mode over recent months, including Twitter and Google Maps. The dark mode in YouTube gives it a cinematic look which is pretty cool. So, without wasting your time let’s get started towards the steps. 1 How to Activate YouTube Dark Mode? 1.1 Enable YouTube Dark Mode in Chrome? This is an experimental feature, and probably Google will make it official soon. Activating Black Interface needs a little bit of playing, but the whole process takes less than a minute. 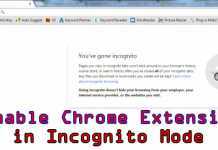 Not only the Chrome browser, but you can also use this mode on Firefox as well as Microsoft Edge browser. 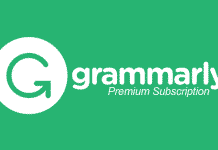 The dark theme changes the look of the entire site dramatically, including your subscriptions page, videos, searches, and even your channel. However, it doesn’t work on the creator studio page yet. If you click on the “EDIT LAYOUT” or “CREATOR STUDIO” button, then it will return to the classic white mode. Enable YouTube Dark Mode in Chrome? A one line code can change the look of YouTube in one second. I have tested this feature on the Windows 10 PC having Google Chrome version 57.0.2987.133. Make sure that, you are using the latest Chrome (Version 57 or higher) on your computer. To check the version, navigate to the three-dot menu on the top right and then, go to Help → About Google Chrome. If you are not using the v57 or higher, then update it now and follow the below procedure. 1) Fire up Chrome browser and open YouTube. It is not compulsory to login into your account. But, you can log in to try new interface of your channel. 2) Now open the “Developer Tools” by hitting Ctrl+Shift+I (Option+Command+I on Mac) on your keyboard. 3) After that, navigate to “Console” tab, paste the below command and press Enter button. 4) Once done, refresh your browser and click on your profile in YouTube and you will find a “Dark Mode” option. If you are not logged in, then click on the three-dot option right before the “SIGN IN” button. 5) Now, click on it and then, enable the toggle “ACTIVATE DARK MODE“. That’s it. The procedure to enable YouTube Dark Mode in Firefox is quite similar in Chrome. 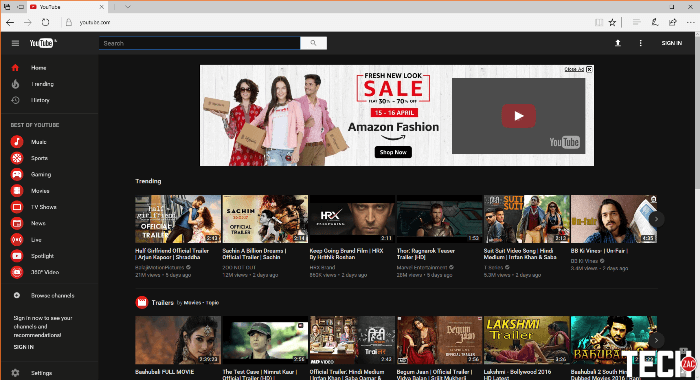 I have tested the YouTube Dark Mode in Mozilla Firefox version 52.0.1 on Windows 10. Make sure that you are using the v52 or higher in order to enable this feature. 1) On the Firefox browser open YouTube website and press Ctrl+Shift+K to open “Web Console” developer tool. Or, you can open it from the three-line menu → Developer → Web Console. 2) Here, paste the below code and hit Enter. 3) After that, refresh your browser and click on your profile or three-dot menu to enable the dark mode like Google Chrome. That’s it. If this procedure doesn’t work, you have to clear the cache and cookies of Firefox first. Then you can try the process to activate YouTube dark mode. According to Microsoft, the new Edge browser is faster than Google Chrome and Mozilla Firefox. 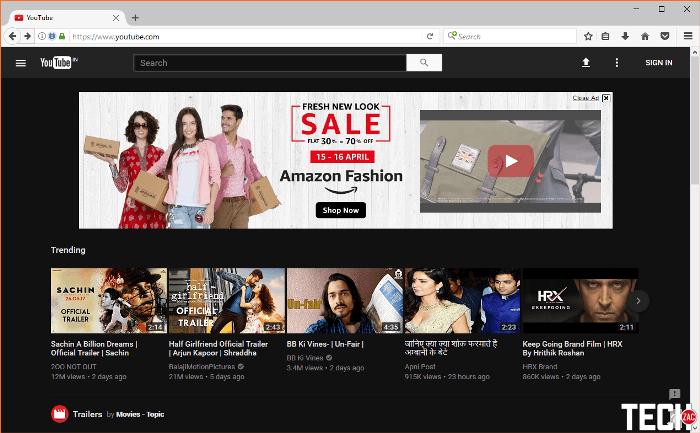 I have tested YouTube dark mode in Microsoft Edge browser version 40.15063.0.0 on Windows 10. Well, follow the below tutorial to do the same. The procedure is pretty much the same as in Chrome and Firefox. 1) Open YouTube website in your Edge browser. 2) To open the Developer Tools, click on the three-dot menu and then click on “F12 Developer Tools” option. Or, you can hit the F12 button on your keyboard to do it quickly. 3) Here, navigate to “Console” tab, paste the below code and hit Enter. 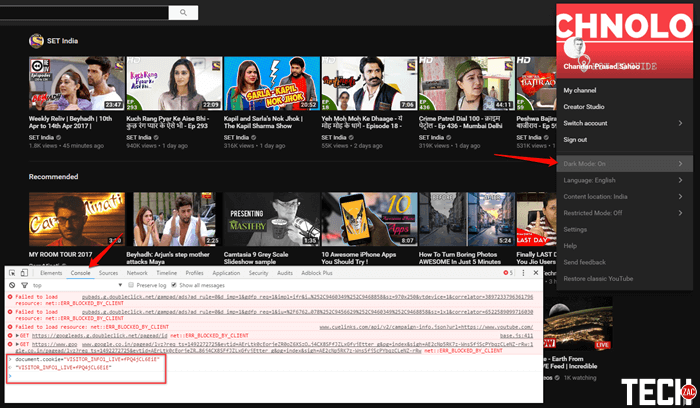 4) Once done, refresh the Edge browser and click on your profile picture to get YouTube dark mode in Edge browser. This was the simple tutorial on how to enable YouTube dark mode in Chrome, Firefox and Edge browser. There is also a problem in this feature. If you close your browser, then you have to follow this procedure again to get the dark theme. Because, this feature hasn’t yet been officially released, but it’s part of a number of improvements YouTube is testing for the website’s layout. For the people who spends a lot of time in watching YouTube videos at night time, it would be a better choice to change night or dark mode to save your eyes. Try the night mode in YouTube today and share your opinion right in the below comment box.